The John P. McGovern Historical Collections and Research Center at The TMC Library has notable historical collections on the foundations of the medical specialties, Texas medicine, rheumatology and North American public health. The archival collections focus on the development of the institutions and hospitals in the TMC in Houston, the careers of Houston physicians and biographical information on Texas physicians. 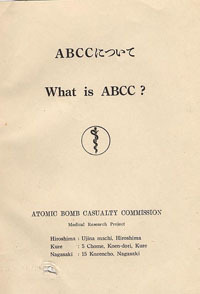 The Atomic Bomb Casualty Commission collection is a resource of materials related the study of the effects of ionized (also known as weaponized radiation) radiation on the survivors of the atomic bombings of Hiroshima and Nagasaki in Japan on August 6 and 9, 1945. 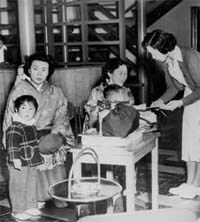 The study began when the Atomic Bomb Casualty Commission was established in 1946 by presidential directive by Harry S. Truman, president of the United States of America. In 1975, primary control of the organization passed to the Japanese and the ABCC was renamed the Radiation Effects Research Foundation. This study remains the longest ongoing epidemiological study in the history of mankind. It is also perhaps one of the largest such studies. 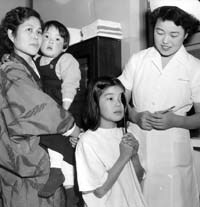 The purpose of the study is to investigate the effects of radiation upon the atomic bomb survivors, the majority of whom were Japanese, although many Koreans, other Asian populations and prisoners of war were either in camps or working as laborers in the area of the bombings. The McGovern Historical Center is the home of special collections at the Texas Medical Center Library. An important group of collections is the ABCC family of collections. This family of collections consists of more than 20 individual collections that include papers of early directors and employees, official publications, photographs, office correspondence, memos, scrapbooks, personal correspondence, journals, film, and realia. The collections date from the beginning of the ABCC in the late 1940s to the RERF in the 21st century. The family of collections measures 267 linear feet of boxes. This guide includes a list of collections and direct access to the finding aids or guides. The finding aids allow researchers to read about each collection, the source of the collection, and a description of the collection. The collection description with describe the contents of each box. Our finding aids may describe at a box level, which is a rough and brief description of the contents. A second method of description is the folder lever where the title of every folder is listed in the collection description. The third method is the item level description. The item level describes every item, such as pieces of paper, within the collection. Most collections are described at the folder level, but many collections include a combination of descriptions at box, folder, and item level. Please consult with an archivist for more information. When requesting information about collections please refer to the Manuscript (MS) # or the Institutional Collection (IC) # as well of as the title of the collection. Please note that this list is not comprehensive, but it does show the bulk of the ABCC holdings at the Texas Medical Center Library. Papers of Raymond Anderson, MD; MS 95; 1 cubic foot. Papers of Gilbert Beebee, MD; MS 100; 6 cubic feet. Papers of Joseph L. Belsky, MD; MS 112; 3.5 cubic feet. Papers of Ivan F. Duff, MD; MS 90; 2 cubic feet. Papers of Jarrett H. Folley, MD; MS 97; 1 cubic feet. Papers Howard B. Hamilton, MD; MS 66; 3 cubic feet. Papers of Marvin A. Kastenabum, PhD; MS 93; 1.5 cubic feet. Papers of Robert D. Lange, MD; MS 64; 1 cubic foot. Papers of Robert W. Miller, MD; MS 101; 1 cubic foot. Papers of William C. Moloney, MD; MS 73; 1 cubic foot. Papers of James V. Neel, MD, PhD; MS 89; 19 cubic feet. Papers of Frank Putnam, PhD; MS 92; 2 cubic feet. Papers of Walter J. Russell, MD, DMSc; MS 63; 4 cubic feet. Papers of William Schull, PhD; MS 67; 54 cubic feet. Papers of Wataru W. Sutow, MD; MS 35; 43 cubic feet. Papers of H. Grant Taylor, MD; MS 44; 43 cubic feet. Papers of Carl F. Tessmer, MD; MS 68; 5 cubic feet. Papers of Herman S. Wigodsky, MD, PhD; MS 65; 1 cubic foot. ABCC Photo Collection. This collection can be found in the library catalog in the ABCC Photo Collection Series. Reference Files. The Reference Files at the McGovern Historical Center include subject files on many topics related to the Texas Medical Center, Houston, Texas, and the Atomic Bomb Casualty Commission. This list of items is kept as a separate list. Please consult an archivist.